Disposable batteries are so yesterday. But did you know that bulky chargers for your rechargeable batteries are about to bid farewell as well? Yes, it is true. Gone are the days when you have to bring your battery charger with its bulky body and messy wires. Moixa Energy Ltd. Has recently introduced the USBCELL, a rechargeable AA battery USB drive. It is a two-in-one product that has been invented to provide users better solutions for the power requirements of their device in a more economic, usable, and environmentally friendly way. The USBCELL looks exactly like any other AA batteries in the market. The only difference is that the end of the battery reveals a USB connector used for charging. The USBCELL, which is a NiMH AA cell that is used like a normal battery, can be recharged via USB. At the same time, it has a built-in intelligent USB charger that allows you to store in and transfer your videos, audio, documents, and other files. Both you can do by simply plugging it into any accessible powered USB port. Once the USBCELL starts to charge, an LED lights up, indicating the charging status of the battery. For instance, if the battery level is below 90%, the LED will stay solid. But once it reached 90%, the LED will begin to flash, indicating that charging is almost complete. USBCell takes roughly around 6 hours and 52 minutes to charge completely. The USBCELL also proves to be very useful for people who use gaming devices that are powered by the usual AA batteries as it can easily be charged in their game station and all they need to do is swap over to continue playing. However, a problem encountered by some users of USBCELL is the fact that they cannot charge a pair of USBCELL batteries on a set of USB ports stacked on top of one another, due to the size and shape of the battery. This however is not an issue for USB ports that are side by side with each other. Another weak point of USBCELL is that it is only capable of 1300mAh, lower than that of current alkaline AA batteries which are capable of providing 1700mAh and other NiMh rechargeable batteries which can provide 1400 to 2900mAh. In other words, its charge will ran out faster than other batteries in the market. But well, in the end, let us not forget that it has a USB feature to boot. 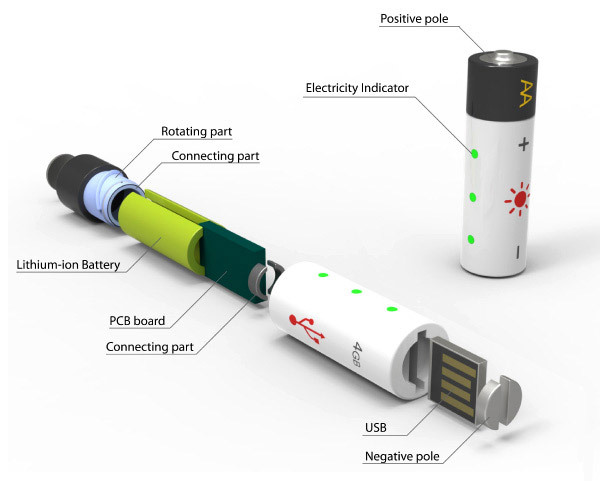 The AA battery USB drive was designed by Wonchul Hwang. This entry was posted in USB Charger, USB Gadgets and tagged AA battery, AA USB Battery, moxia energy, rechargeable battery, usbcell. Bookmark the permalink.